The McMillan Commission plan of 1901-1902 envisioned a memorial to the assassinated President where the Mall axis met the Potomac River. According to the plan, the memorial would be joined to the Capitol Building by a decorative canal. That would mean several major adjustments, including the relocation of many railroad tracks into a new Union Station north of the Mall. 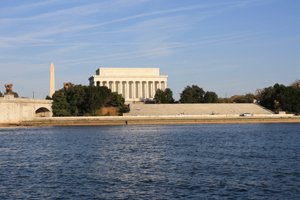 The Tidal Basin would also be reshaped. In addition, the George Washington Parkway was also finally proposed, although it had been surveyed two decades earlier. The Lincoln Memorial was authorized by Congress in 1911. Henry Bacon and John Russell Pope, New York architects, were invited to prepare designs. Bacon was selected to prepare the final design, which was approved by Congress in 1913. Construction began in 1914. Land for the site was quite marshy and inaccessible at the time, but reclamation efforts continued. The memorial was dedicated in 1922. The memorial, made of Colorado-Yule marble, is similar in architectural lines to the Greek Parthenon. The columns are both Doric (on the outside) and Ionic (on the inside). The 36 columns on the outside represent the 36 states at the time of Lincoln's death. On the outside walls are the names of the 48 states as of 1922. Interestingly, there is a typographic error--the date "1802" for Ohio was recognized as 1803 by an Act of Congress in 1953. The statue of Lincoln inside--by artist Daniel Chester French, showing the President during the Civil War--is designed to a scale that would make Lincoln 28 feet tall if standing. There are 28 blocks of Georgia white marble in the statue, which took four years to carve. "Lincoln's Legacy," an exhibit planned and paid for by American youth, is located in the lower lobby. The Lincoln Memorial has been the site of many of the most dramatic events in Washington in recent years, including civil rights and anti-war demonstrations in the Capital.